Canadian patriotic song, written in 1867 on the occasion of Canadian Confederation. It was used as an unofficial national anthem of English Canada until 1939, when O Canada became more commonly used for this purpose. 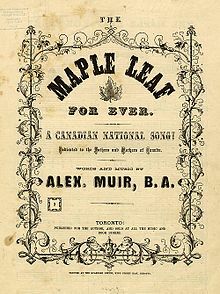 Cover of the original edition of "The Maple Leaf Forever". "The Maple Leaf Forever" in The Canadian Soldiers' Song Book (1916). "The Maple Leaf Forever" (unsourced).